Tokyo, Japan, December 21, 2018 – Mitsui Fudosan Co., Ltd., a leading global real estate company headquartered in Tokyo, and Obayashi Corporation announced today that they have started the joint development of an automated conveyance system for materials and other items in an effort to improve productivity at construction sites. Prototype production and operation checks have been completed at this time. From 2019, field trials are scheduled to begin at a new building construction project at Mitsui Fudosan Logistics Park Funabashi II (Funabashi City, Chiba Prefecture), a project in which Mitsui Fudosan is the building owner and Obayashi will perform the construction work. Urgent action is needed at construction sites to address the anticipated decrease in construction workers due to Japan’s aging population and low birthrate. In response, Obayashi has been advancing the automation of materials conveyance work to enable its workers to concentrate on processing and installation tasks that require technical proficiency and experience. As a company responsible for the creation of neighborhoods, Mitsui Fudosan believes that it has an obligation to work together with construction companies on this priority. The two companies have been working to develop robots designed to conserve labor at construction sites and deploy the robots to those sites. In this process, the two companies have decided to conduct this joint development project. Going forward, Mitsui Fudosan aims to adopt this system as a standard feature of construction projects for new buildings, such as office buildings and logistics warehouses, by advancing the development of the system. Concurrently, Mitsui Fudosan will look into applying the system’s technologies to completed buildings that have entered service. One example would be an automated garbage conveyance system for a building. Leveraging the expertise gained from the development of this system, Obayashi will seek to reduce labor requirements even further by achieving automated nighttime conveyance of materials at major construction projects for new buildings, such as skyscrapers. 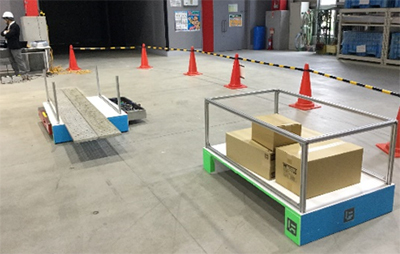 The automated conveyance system was developed by augmenting the low-platform AGV (Auto Guided Vehicle)* developed by Obayashi with various functions. * Low-platform AGV: Please refer to the news release dated October 19, 2015, by Obayashi Corporation (available in Japanese only). 1. The AGV will conduct an automated search of materials in a materials stockyard and automatically load and unload the materials. 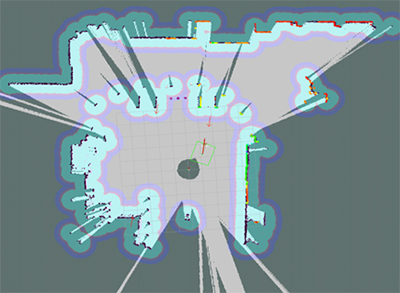 Materials are loaded onto dedicated pallets with standardized shapes and colors. The AGV identifies dedicated pallets using two cameras: one for pallet search and another for pallet identification. The pallet search camera is retractable and extends from the platform only when searching for dedicated pallets in the materials stockyard. The pallet identification camera identifies the target material by reading a two-dimensional marker attached to the side panels of the dedicated pallets. 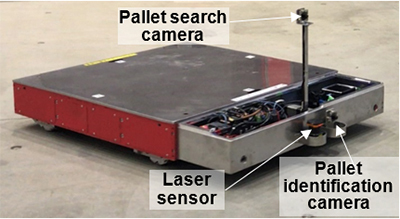 The AGV moves under the materials pallet it has automatically identified, loads the cargo, and identifies its position relative to the surrounding environment through laser sensors. It then conveys the cargo from the materials stockyard to the material’s destination, and unloads the material at the destination. The AGV does not require the installation of guidance lines and pathways via magnetic tape, which had been required by previous automated conveyance systems. 2. The AGV can move up and down between building floors by summoning a temporary elevator on its own by communicating with an operator. The AGV can summon an elevator by transmitting its current floor and destination floor to the operator of a temporary elevator in a building via a dedicated tablet. Because horizontal movements on a single floor are carried out autonomously by the AGV, materials can be conveyed by having only one operator of the temporary elevator communicate with multiple AGVs. 3. Automatically get on and off temporary elevators. The AGV can automatically get on and off temporary elevators while carrying temporary construction materials. 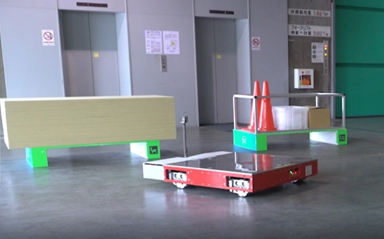 The two companies have successfully developed a materials conveyance system capable of autonomously moving within a construction site by combining the functions in sections 1 and 2 above.